“In spite of contradictory outcomes being suggested by the various methodologies my leaning for the US market is that a top may have been put in place in the last trading session and hence a decline may commence if not in the next trading session then certainly early next week. Wave 2’s can often retrace most of wave 1’s ranges however initial targets of around 1329 (50% retrace) or 1321 (61.8% retrace) would appear to be sensible for a starter. Right on cue the S&P500 made a top on the following Monday and commenced what I believe was a Minuette wave 2. Refer to EW count later in the Market Wrap. Our 1329 target was reached and may mark a low as suggested in last week’s Market Wrap. Similarly the XJO continued its downward journey as suggested. Last weekend’s Chart of the Day topic discussed one of the topics that could cause problems for market sentiment and this week we once again have another topic that continues to play heavily on the US market. Today, the Labor Department reported that nonfarm payrolls (jobs) increased in April for an eighth consecutive monthly gain. Today’s chart provides some perspective on the US job market. Note how the number of jobs steadily increased from 1961 to 2001 (top chart). During the last economic recovery (i.e. the end of 2001 to the end of 2007), job growth was unable to get back up to its long-term trend (first time since 1961). More recently, nonfarm payrolls have pulled away from its 40-year trend (1961-2001) by a record percentage (bottom chart). In fact, the current number of US jobs was first reached in early 2000. In its last trading session the S&P500 had a range of 18.78 points, peaking at 1354.36 (up 1.04% from the previous close) and finally closing at 1340.2 up 5.1 points (0.38%). Since the close last Friday the index lost 1.7%. In fact the index at one stage was down 3.02% from its peak of 1370.58. As a first step let’s look at my currently favoured EW count for the S&P500. As can be seen from the above chart I believe that we are currently in Minuette wave 2 of Minute wave 3. This count will remain valid as long as the index does not go down beyond the termination level of Minute wave 2 located at 1294.7. Has Minuette wave 2 completed? At this point in time this is unclear. Looking at the daily chart below we can see that there are two positive indications. The index continues to trade within a rising channel and currently the MBB is providing support for the price action. On the negative side however we see some slight negative divergence between the price action and the LOI and the LOI has just given a ‘sell’ signal by crossing to the downside. If we now go down to the 99 minute intraday time frame in the chart below we can see that once again we have some negative and positive signs. On the positive side the LOI has now given a ‘buy’ signal by crossing upwards and we have some obvious support at the current levels as shown by the two horizontal red lines. We are also close to the LBB which indicates that we may be nearing a bottom in the short term. On the negative side the MBB is currently acting as overhead resistance and will need to be conquered if a rally is to take place. The other negative is that the Bollinger Bands are currently sloping downwards. If we now drill down further to the 60 minute intraday chart we can see that there is some positive divergence showing up at this level. We can see that whilst UBB and MBB are sloping down, the LBB has flattened and there is once again some good short term support at these levels. At this moment the MBB is acting as overhead resistance however it was recently breached to the upside and based on the current indications this is likely to be repeated. If we now look at the weekly planetary chart for the S&P500 we can see that Saturn has played a major role in constricting the index between 1335 and 1365. One of these Saturn lines needs to be breached in order to determine the future direction of the index. 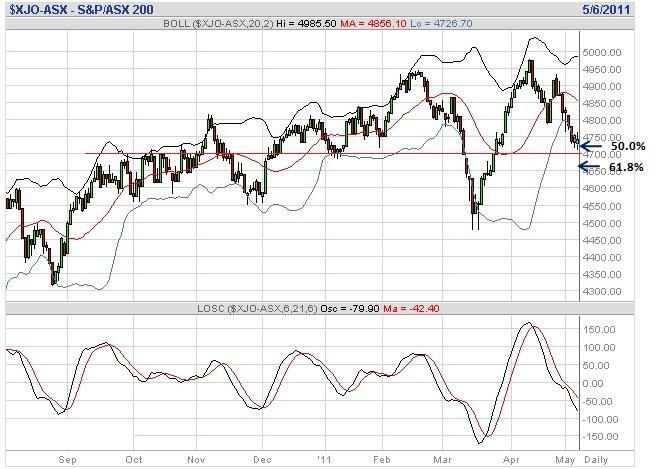 In last weeks Market Wrap the Conti cycle chart for the XJO suggested a potential bottom on the 6th May. Remembering that there is a +/- 3 day order of accuracy on the Conti cycles it pays to use them as a guide only. Statistically from a lunar perspective, Full Moons tend to produce lows and the next Full Moon is on the 17th May. Once again with statistics we have to remember that these are ‘averages’ of a range of data and whilst the average may produce bottoms, there will be times when postive market moves can take place. So, taking all of the above information into consideration we can see that the daily chart indicates that there could be further downward movement and the Lunar cycles suggest this is also a possibility. On the positive side we have a Conti cycle suggesting that a bottom may have been put in for the XJO on Friday and the shorter term time frame charts suggest that the current price levels may have some reasonable support at this time. As shorter term time frame price action preceed longer term time frame price action I have a leaning towards the possibility of a neutral to positive week on the program for next week. The following chart provides the current status for the XJO Conti cycles. We can see that it is feasible that a bottom may have been put in place on the 6th May and that the next cycle top should occur some time around the 13th May time frame. This would be followed by a possible low around the 18th May (1 day out from a Full Moon date) and then the next potential high is the 6th June. It remains to be seen if these dates play out. The lead from Wall Street currently has the ASX200 futures contract suggesting a positive move of 8 points on Monday’s open. The ADRs on the NYSE had BHP up 1.46%, RIO up 1.12% and WBC up 2.45%. Those ADRs certainly suggest a more positive move than suggested by the ASX200 futures contract. As with the S&P500, the XJO has lost 1.7% since the close last Friday.Unlike the S&P500 though (which reached its recent market top on the 2nd May 2011, the XJO made its recent market high on the 11th April 2011 and has fallen 4.7% since that time. The following daily chart just shows how ugly our market has behaved in recent times compared with the S&P500. The positives are that the index has tested the 50% Fibonacci retrace level on two occasions and has failed to close below that level. The other positives are that there is a good support level (refer to red horizontal line) and we are close to the LBB at the present time. Note also that the UBB has formed a top. This is an early sign that a bottom may be in place for our index. The main negative is that the LOI is still giving a ‘sell’ signal.. The shorter term 99 minute chart shows where the current support has come from. The main negative is that the MBB has been acting as overhead resistance however the positives outweigh the negatives. First of all is the strong support level at the current prices. The next one is that the LBB has flattened and finally the LOI has given a clear ‘buy’ signal. The 60 minute intraday chart of the XJO confirms the indications in the 99 minute chart and adds another observation which is that the BB’s are squeezing indicating that a significant move is about to occur. The following XJO weekly planetary chart shows the negative influence of the overhead Saturn line on the index in recent weeks. What appears strange is that there is no support shown by any planetary lines on the weekly chart above at the current levels. So what can drive the market up from here? I have taken the liberty of posting a daily chart of the XJO on Randall’s Astrology and Stock Market thread found at the following link which shows that the current price action is currently squeezed between rising Mars and Jupiter lines. If we do have a positive day on Monday as expected then it’s likely that the index may rally on the back of the Mars line. I did not post the chart in this Market Wrap because it needed the black background in order to show the planetary lines clearly. So once again, it would appear that the above observations are leading me to the conclusion that we may be in for a positive period in the coming week. Whilst the sentiment in the market has been extremely negative in recent times and in spite of the fact that lows often come near the Full Moon dates, the indications are that we may be heading into a positive period in the coming week for both the US and Australian markets. The information in this market wrap is provided for educational purposes only and does not have regard to any particular person’s investment objectives, financial situation or needs. The information must not be construed as advice to buy, sell, hold or otherwise deal with any securities or other investments. Accordingly, no reader should act on the basis of any information in this market wrap without first having obtained investment advice from a suitably qualified advisor.